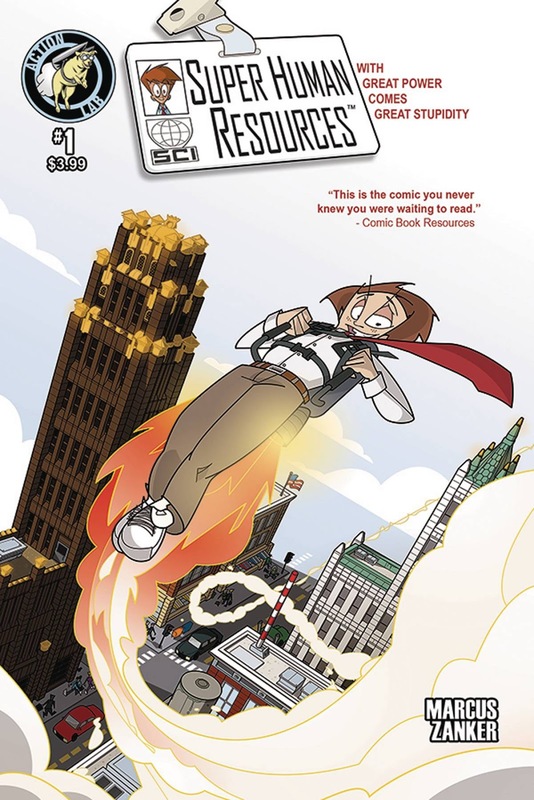 The Fellowship was fortunate enough to obtain a copy of SUPER HUMAN RESOURCES #1 from Action Lab Comics. Ken Marcus writes, Armando Zanker draws and colors, and Brant Fowler letters. SCI is doing great, and it’s all thanks to Tim the temp. The guy’s just got a knack for organizing things. But the Board has other plans, and they’ve brought in a freelancer for help. The plan is to get Tim out of there and let chaos reign. But it’s hard to tell if that plan will be enough to bring down the super-powered corporation. Now this is how a super-powered group should work in a realistic setting: neurotic as hell and twice as clueless. It’s easy for supers to fall into the trap of big explosions and bigger egos, and this story refuses to do that. It’s based around the administrative side of running a super team, which is really entertaining, as it turns out. The art is fun too, with great face work and bold colors. So if you’re getting a little burned out on the cinematic supers these days (and maybe, just maybe I can relate), check this book out. It’s a very cool change of pace from all of that. SUPER HUMAN RESOURCES #1 is available now at your FLCS or at actionlabcomics.com.